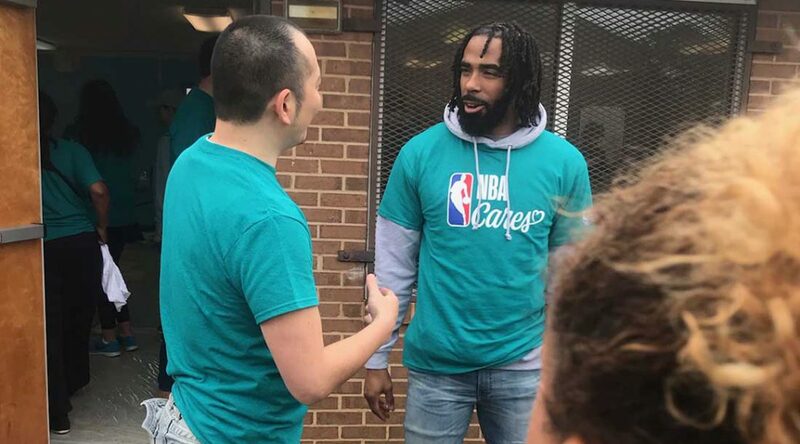 CHARLOTTE, N.C. — Finally past the other side of the trade deadline, Memphis Grizzlies star point-guard Mike Conley was happy to be assisting with the community service project in West Charlotte. On the Friday of All-Star weekend, NBA legends past and present collaborated with dozens of NBA Cares volunteers to refurbish homes in the West Charlotte area. In addition to Conley, Klay Thompson, Miles Bridges, Buddy Hield, Reggie Bullock, Jason Collins, and others gathered at the Little Rock Apartments, partnering with United Way to help with restoration, as well as executing a food drive at the South View Recreation Center nearby.